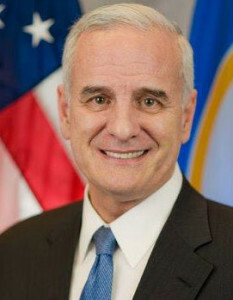 Minnesota Governor Mark Dayton today said he’s “relieved” Republicans in the Iowa House were unable to gain enough support for a bill that might have given some Iowans access to Minnesota’s medical cannabis program, but Dayton is not completely closing the door on the concept. According to Dayton, who is a Democrat, the top Republican in the Iowa legislature contacted the Republican speaker of Minnesota’s House of Representatives last week to open discussions. Dayton said Iowans might be prosecuted in federal court for buying cannabis oil, pills and vapors from Minnesota and transporting the drugs across state lines. Minnesota policymakers legalized production of cannabis as treatment for a variety of medical conditions in 2014. So far, only two of the eight dispensing sites have opened due to the limited number of Minnesota patients who’ve qualified for the program. Iowa advocates who’ve been pressing for expansion of the state’s limited medical marijuana law say they want an Iowa-based system for growing and dispensing cannabis products for treatment of a variety of medical conditions.